Quick tips via video regarding a sound marketing strategy. In this final video in this series, Granison Shines – CMO of Direct Business Marketing, summarizes the past 5 videos on how you should go about your marketing budget and strategy for 2017. Take a look at the video and let us know if you have any questions. Be sure to take advantage of your free consultation by getting on my calendar here – https://directbusinessmarketing.com/scheduler. There’s no obligation to reserve our services. One aspect of your marketing campaigns should be the identification of the strategic marketing campaigns you’re going to launch. 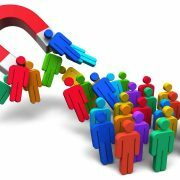 Truthfully, most organizations omit several marketing campaigns, not purposefully, nonetheless omission means prospective leads not getting the attention they need. Therefore, we need to close the gap on leaving leads exposed for falling through the cracks. 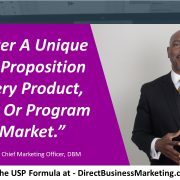 If you have any questions, take advantage of your free consultation by getting on my calendar here – https://directbusinessmarketing.com/scheduler. There’s no obligation to reserve our services. When you think about where you should be marketing, make sure to have our marketing process close in mind – Generate, Capture, Store, and Nurture. This will help you lay the proper path for marketing success. Focus on the “Generate” column, the marketing locations, because this is where you’re going to spend most of your marketing budget. I’m not saying to not spend time on the other 3 sections, I’m just saying that a large portion of your marketing budget will be spent here. Especially, if you’re running a large marketing campaign. 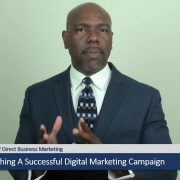 In this video, Granison Shines, CMO of Direct Business Marketing, discusses on how you should think about where you should be marketing. 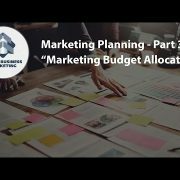 To further discuss the budget aspect of your marketing campaign, business owners are asking themselves, “How much should we allocate to our marketing budget?” Since many have experienced their marketing dollars not returning the investment they wanted or expected, the topic of a business’ marketing budget has become taboo. However, if you’re in business and your marketing, you’re going to have this conversation – period! In this video, Granison Shines – CMO of Direct Business Marketing, discusses the question of marketing budget allocation and how to make sure you’re not taken to the cleaners. I’d say that the marketing budget is one of the most important and least attractive components of your marketing campaign(s) that most business owners do not want to discuss. It can be scary at times, especially when you’re a small business and your operating on limited funds, but you want the best bang for your buck. 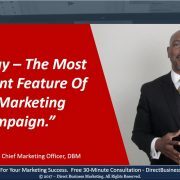 In this video, Granison Shines – CMO of Direct Business Marketing, discusses this question and more on how you should think about your marketing from a budgetary perspective. Marketing planning and budgeting for the upcoming year should adhere to a marketing planning process that’s proven to get results. Every year businesses toil over what and how their marketing plan should look like. Now, you can use Direct Business Marketing’s process to make your marketing planning sessions more streamlined and strategic. In part 1 of this short video series, Granison Shines, CMO of Direct Business Marketing, talks about how you can kick off your 2017 marketing planning and budgeting sessions in the right direction. Using DBM’s marketing process – Generate, Capture, Store, and Nurture. 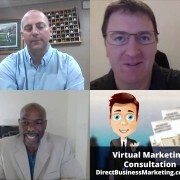 Be sure to schedule your FREE consultation with Granison here – https://directbusinessmarketing.com/scheduler . It stands to reason that EVERY business could/should have a marketing plan. But it doesn’t have to be overly complicated. Granison shares some great ideas in this video, but we strongly suggest gleaning some knowledge from him or another one of our marketing consultations by signing up for a free marketing consultation. No cost to you, you pick the time, just 30 minutes or less that could change the future and direction of your business.